Tidewater Community College engineering students hope more than 300 hours of work pays off in two minutes of time. Eight engineering club students will travel to Seattle on June 13 to compete in the American Society for Engineering Education Two-Year College Division Model Design Competition. Their objective? Design and build an autonomous robot that can collect and deposit 12 colored wooden fish cutouts (red, blue, yellow, green) and deposit them in corresponding colored fish bins. 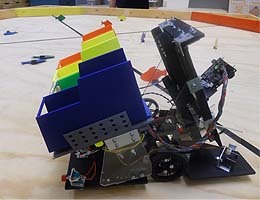 The robot, that must stand 8 x 12 x 10, must complete the task aboard a plywood track in no more than 120 seconds. Further specifications must be met in terms of supplies used and cost, which cannot exceed $400. Students Brenden Wilber, Staci Muir, Alex Kostyn, Alexis Allbritten, Andrew Denbow, Brandon Simon, Chris Presley and Shante Rose collaborated on the final product – an intelligent fish-gobbling robot that they affectionately named Bruce, for the friendly shark in “Finding Nemo.” The students started the project in January, finding extra hours between and after classes. Fourteen teams will compete. The TCC group, accompanied by professors Paul Gordy and Kenneth Grimes and Sally Daniel, coordinator for recruitment and retention in engineering, hope to bring home first prize. “We’re working as a team,” said Wilber, who graduated in the spring and will transfer to the College of Engineering at Virginia Tech this fall with plans to be a chemical engineer. They’ve printed and re-printed parts on the 3-D printer in the Advanced Technology Center on the Virginia Beach Campus. They’ve gone through numerous prototypes, using supplies that range from hot glue to 12 U.S. pennies to plywood used to construct the track that will be replicated in Seattle. And while Bruce works like a charm on the video they’ve posted on the club’s Facebook page, ensuring the robot works like perfection on contest day is the challenge. A glitch can mean point deductions. 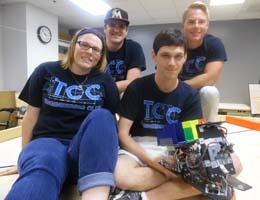 Teams are judged on design evolution, robot operation, fabrication methods, design analysis and overall exhibit quality. “This is the hardest competition they’ve ever had,” Wilber said. The competition is one part of a four-day conference with the American Society for Engineering Education annual convention.